Ask not what your country can do for you; but what you can do for your country. In a personal notebook (1945-46). Discussed in Hugh Rawson and Margaret Miner, The Oxford Dictionary of American Quotations (2005), 201, as possibly being a very brief paraphrase of a verse by Robert Frost from 'The Wall' (1914) (See Robert Frost quotations page on this site). Elsewhere, it has been suggested to be a summary paraphrase of a much longer passage in G.K. Chesterton, The Thing (1929). (See G.K. Chesterton quotations on this site.) Meanwhile, many collections of quotations incorrectly attribute the short quote as worded above directly to either Robert Frost or G.K. Chesterton. Perhaps scientists have been the most international of all professions in their outlook... Every time you scientists make a major invention, we politicians have to invent a new institution to cope with it—and almost invariably, these days, it must be an international institution. Truth is a tyrant-the only tyrant to whom we can give our allegiance. The service of truth is a matter of heroism. Letter to Monsignor Schieder regarding Catholic Youth Week. 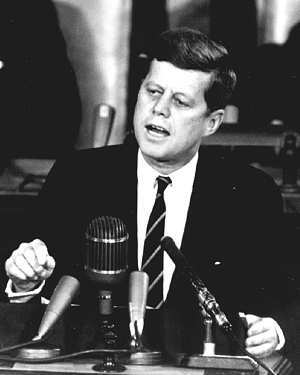 On web site of John F. Kennedy Presidential Library and Museum. We choose to go to the moon. 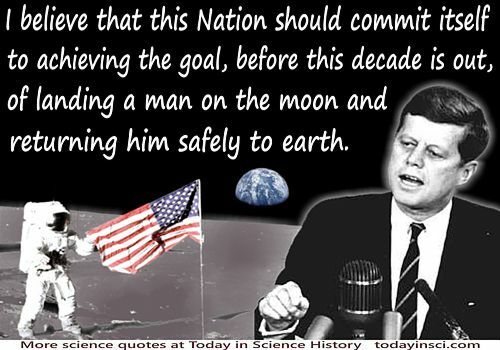 We choose to go to the moon in this decade... not because they are easy but because they are hard.